These snowflakes look really complicated to make, don't they? They're not! I made them with my second grade class - I promise it's not hard. And they're all over Pinterest right now. There are several blogs that have tutorials on how to make these. 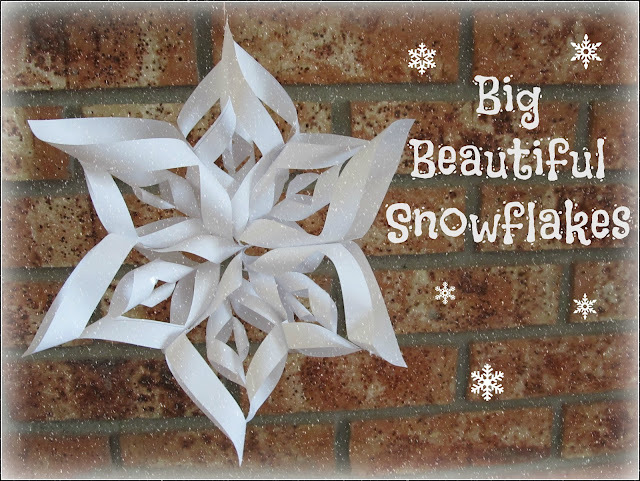 The one that I found most helpful was at Ellinee Journal and this blog even has printables that you can use to make small, medium, and large snowflakes. If you're doing this project with young children, it's a good idea to use the printable so they know where to cut. Once you've made a few and get really good at it, you won't even need to use the printables! Oh they are so cute. Will have to try those. Thanks for sharing. My sister made one of these last year, and I've been wanting to find a tutorial. Thanks for sharing the link! This is such a pretty snowflake!! I need to make some!! Thank you for linking up with Thursday Obessions!! Cute! I want to try these with my 3 year old! I have seen these the last two years and loved them. I thought they looked difficult. I leave out Winter themed decor for January. Would love to make a few of these. Hopping over to see printable. Also pinned it. Thanks so much for sharing it with Share Your Cup. Just wanted to mention that if you take off word verification you will get alot more comments. Some people just give up and don't try when they see that. It can be frustrating. Sometimes it works the first try. Other times it takes three. Beautiful! Thanks for linking up. I am following via Pinterest now too! It's beautiful! I would love to make garland with those. Thank you for sharing it at SHOW-licious Craft Showcase! Hi, just hopping by to let you know that I will be featuring you at Share Your Cup today. Hope you had a wonderful Christmas! Thanks for featuring my 3D paper snowflakes! Happy new year! We made these one year & I never got to them this year. Always fun. Hope you had a great Christmas! Thanks so much for featuring my 3D paper snowflakes! Wishing you a very happy new year! so pretty! Thank you so much for sharing! Wow - love the snowflake!! Thanks for linking up at Romance on a dime!! Those are really cool. My daughter made them in kindergarten at school before she was homeschool. At home she made a ton more out of all different colors. They are a great cutting activity for little ones. These are too cool! I have to make these with my kids one rainy day before Christmas! These snowflakes are so pretty! Love the glittery touch. I made some a few years ago with two toned paper, the tutorial and template you linked to is great! would love it if you'd stop by too.